Early on Wednesday 4th May 2011, in the skies above Mojave Air and Spaceport CA, SpaceShipTwo, the world's first commercial spaceship, demonstrated its unique reentry ‘feather’ configuration for the first time. This test flight, the third in less than two weeks, marks another major milestone on the path to powered test flights and commercial operations. This latest flight saw a 6:43AM (local) runway take off for VSS Enterprise, attached to its WhiteKnightTwo (WK2) carrier aircraft, VMS Eve. At the controls of the of the spaceship were Scaled Composites' test pilots Pete Siebold and Clint Nichols whilst Mark Stucky, Brian Maisler and Brandon Inks crewed the purpose built, all composite, twin fuselage WK2. After a 45 minute climb to the desired altitude of 51,500 feet, SS2 was released cleanly from VMS Eve and established a stable glide profile before deploying, for the first time, its re-entry or "feathered" configuration by rotating the tail section of the vehicle upwards to a 65 degree angle to the fuselage. It remained in this configuration with the vehicle's body at a level pitch for approximately 1 minute and 15 seconds whilst descending, almost vertically, at around 15,500 feet per minute, slowed by the powerful shuttlecock-like drag created by the raised tail section. At around 33,500 feet the pilots reconfigured the spaceship to its normal glide mode and executed a smooth runway touch down, approximately 11 minutes and 5 seconds after its release from VMS Eve. All objectives for the flight were met and detailed flight data is now being analysed by the engineers atScaled Composites, designers and builders of Virgin Galactic's sub-orbital spacecraft. George Whitesides, CEO and President of Virgin Galactic, said: "This morning's spectacular flight by VSS Enterprise was its third in 12 days, reinforcing the fast turnaround and frequent flight-rate potential of Virgin Galactic's new vehicles. We have also shown this morning that the unique feathering re-entry mechanism, probably the single most important safety innovation within the whole system, works perfectly. This is yet another important milestone successfully passed for Virgin Galactic, and brings us ever closer to the start of commercial operations. Credit is due to the whole Scaled team, whose meticulous planning and great skill are changing the course of history." "In all test flight programs, after the training, planning and rehearsing, there comes the moment when you have to go up there and fly it for real. This morning's flight was a test pilot's dream. The spaceship is a joy to fly and the feathered descent portion added a new, unusual but wonderful dynamic to the ride. The fact that it all went to plan, that there were no surprises and that we brought VSS Enterprise back to Mojave safe and sound is a great testament to the whole team." Perhaps the most innovative safety feature employed by SpaceshipOne and now SpaceShipTwo is the unique way it returns into the dense atmosphere from the vacuum of space. This part of space flight has always been considered as one of the most technically challenging and dangerous and Burt Rutan was determined to find a failsafe solution which remained true to Scaled Composite's philosophy of safety through simplicity. His inspiration for what is known as the feathered re-entry was the humble shuttlecock, which like SpaceShipTwo relies on aerodynamic design and laws of physics to control speed and attitude. 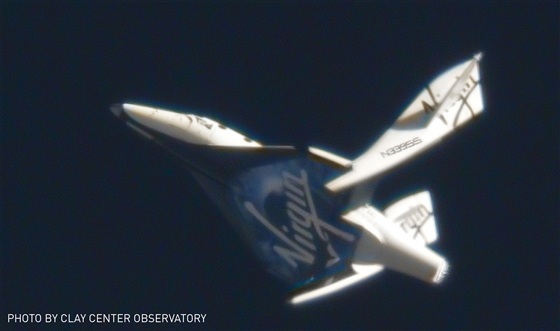 Virgin Galactic is on track to be the world’s first commercial spaceline. The new spaceship (VSS Enterprise) and Mothership (VMS Eve) are both being developed for Sir Richard Branson’s Virgin Galactic by Mojave-based Scaled Composites. Founded by Burt Rutan, Scaled developed SpaceShipOne, which in 2004 claimed the $10m Ansari X Prize as the world’s first privately developed manned spacecraft. Virgin Galactic’s new vehicles share much of the same basic design but are being built to carry six customers on sub-orbital space flights, allowing an out-of-the-seat zero gravity experience and offering astounding views of the planet from the black sky of space. The VSS Enterprise test flight program will continue through 2011, prior to commercial operations, which will be based at Virgin Galactic’s future headquarters at Spaceport America in New Mexico.